Starting at the Verrazano-Narrows bridge on Staten Island the New York Marathon winds its way through Brooklyn, Queens, skimming the Bronx and into Manhattan. What a route. 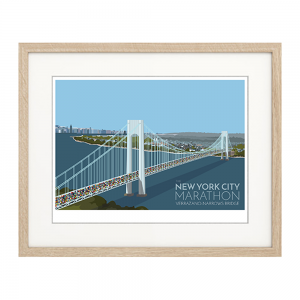 I’ve tried to capture the energy at the start of the race – people from all nations packed onto the bridge, full of adrenaline and hope – oblivious to the lactic acid build up awaiting them on Fifth Avenue. Huge kudos to anyone who has run the New York Marathon. Huge. Prints available to buy unframed on Etsy as A4 (£12) or A3 (£20).